At 2356 hours, the Union Fire Company No. 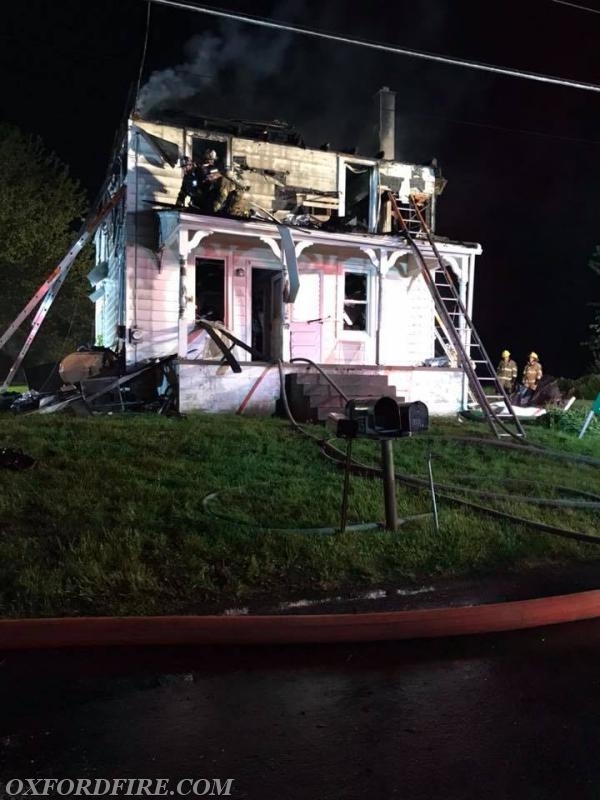 1, along with units from Quarryville (57), Cochranville (27), and Rising Sun, MD (8), was alerted for the reported house on fire in the 200 block of Roneys Corner Road in Lower Oxford Township. Chief 21 (Meadowcroft) arrived and confirmed a working fire with fire showing from the roof. He established the Command and requested the Working Fire Dispatch and the First Alarm Tanker Task Force. These requests added Medic 94 (SCCEMS), the Chester County Fire Marshals, and Tankers from Robert Fulton (89), West Grove (22), Avondale (23), Cochranville (27), and Bart Township (51). Engine 21-1 (Safety Officer Booth) pulled past the house and the crew stretched an 1.75" hand line to the front door to begin fire suppression efforts. Ladder 21 (Captain Greene) took the front of the house. The aerial was set up while the crew threw ground ladders to the upper floors. Tanker 21 (Past Chief R. Terry) dumped the folding tanks and the water at the intersection of Roneys Corner and Bethel Roads, with Engine 21-2 (Lieutenant Kelley) establishing the draft and supplying the scene. Additional arriving units staged and sent their crews to the scene to assist with fire suppression and overhaul. Deputy 57 was assigned as the Water Supply Officer. Responding Tankers dumped their water and refilled at a hydrant on Lancaster Avenue in the Oxford Borough where Engine 22-1 had established a Fill Site. 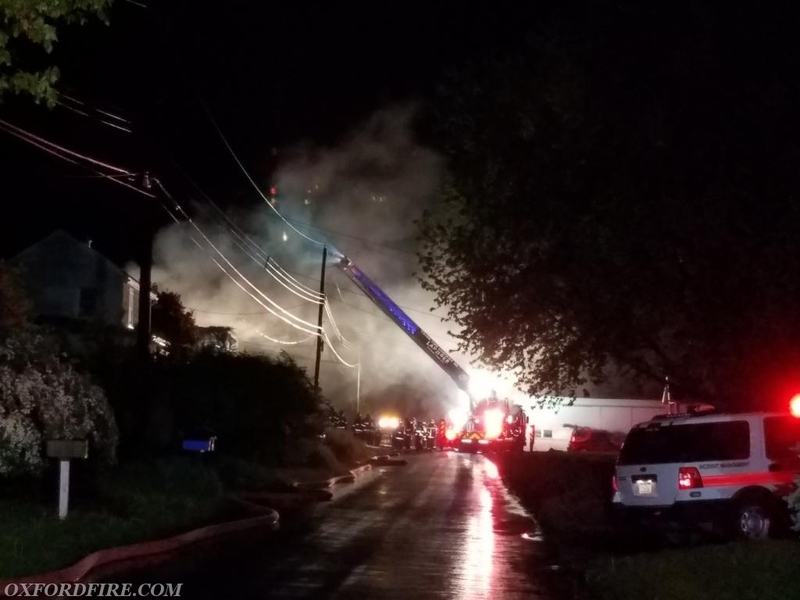 Once the bulk of the fire was knocked down, the crews were able to re-enter the structure and extinguish the remaining fire. A total of four hand lines were utilized during the incident. 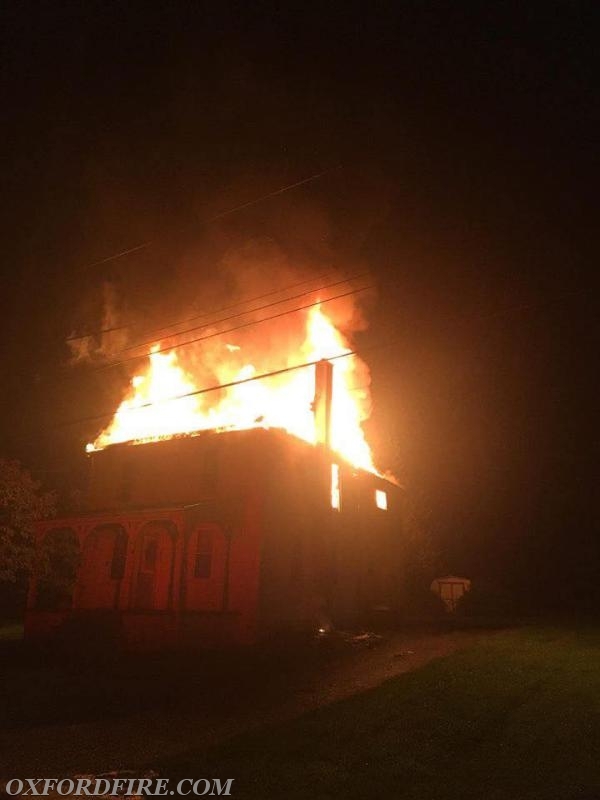 The fire was placed under control at 0130. 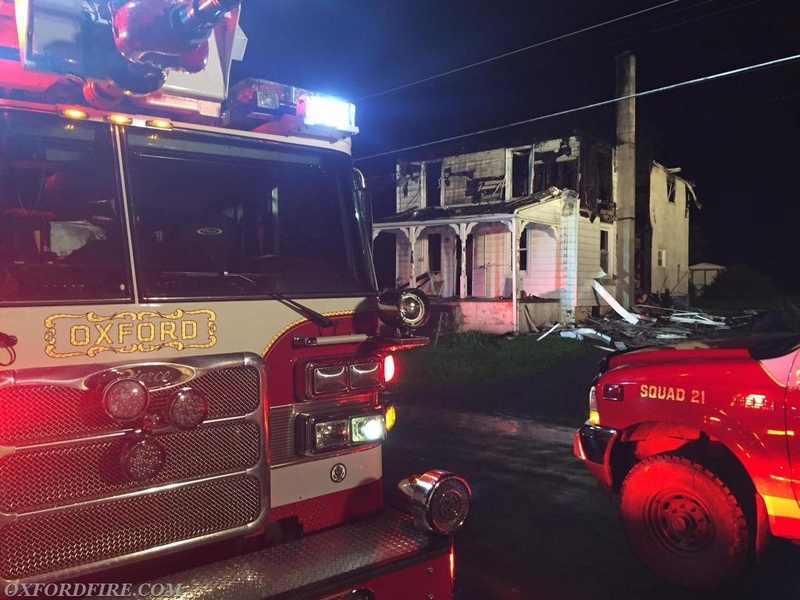 The Chester County Fire Marshals investigated the fire and no injuries were reported. The final units were clear of the incident at 0321 hours. Engine 36 (Po-Mar-Lin) and Tanker 24 (Kennett Square) transferred to Station 21 and handled three seperate incidents. Rescue 57 (Quarryville) and Rescue 27 (Cochranville), and Lancaster County Medic 56-5 (LEMSA) handled a Motor Vehicle Crash at Route 472 and Jackson School Road during the fire as well.